Argyll – Nature’s Paradise has been an inspiration to artists since ancient times with some of the most prolific ancient rock art in Europe found in and around Kilmartin Glen. To celebrate this legacy and the rich creative talent living and working in Argyll & the Isles today, we have commissioned 8 illustrations from 8 different Artists. 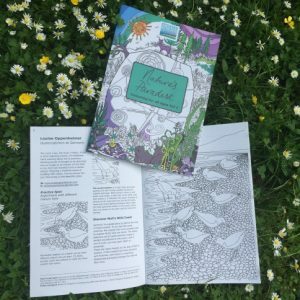 The artists illustrated locations from across Nature’s Paradise that have provided a deep source of inspiration and which are accessible to all. So as you travel Argyll and colour in the illustrations why not visit our special places for a little extra inspiration. These are wonderful to explore and can readily be combined with studio visits as a great day out. You can wander through the gardens and enjoy our unique blend of peace and tranquillity. Or for the more energetic there are woodland paths and cycle trails leading to spectacular view points and beaches with endless opportunities to spot wildlife and explore castles, duns and the ruins of abandoned townships.